The consistent, quality performance that ColorLok Technology offers is the new standard for better printing. All papers are not created equal. 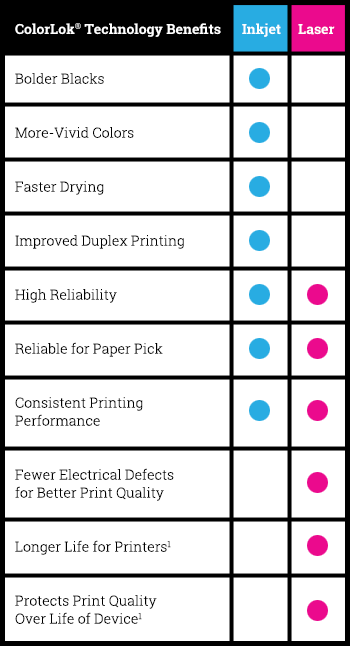 Papers that meet the ColorLok performance standards provide significant features and benefits to users of inkjet and laser printers compared to papers that do not meet ColorLok standards. When using an Inkjet printer, paper with ColorLok® Technology provides more vivid colors, bolder blacks and faster drying time. Black pigment particles remain at or near the paper surface, resulting in improved optical density, reduced strikethrough and feathering and higher edge sharpness. Colored pigment particles remain at or near the paper surface, resulting in richer, more vibrant colors. While pigment particles remain near the surface, the water-based ink vehicle sinks into the paper fiber, resulting in faster drying times and reduced smearing. For more than two decades, laser printers in the home and office have established a reputation for value, reliability, quality, and long service life. Papers with ColorLok® Technology offer enhanced recyclability because the ink stays on the surface of the paper. Removing the ink from the paper is a key step in the recycling process and is made easier with ColorLok Technology. ColorLok Technology allows you to buy recycled plain papers without compromising quality. ColorLok Technology delivers the same excellent print quality as papers with no recycled content.